To provide sacraments and accompaniment to those incarcerated as well as provide ministry volunteer opportunities to our faithful in the pews. Our Diocesan Jail and Prison Ministry currently serves 6 state prison facilities in northwest Missouri, as well as the county and city jails in the counties throughout our diocesan boundries. Our ministry is guided by the Holy Spirit and through the three pillars of our ministry: our Volunteers in Corrections, Volunteers in Prayer, and the Prison Pen Pal Ministry. The MAX Diocesan Prison and Jail Ministry volunteers who volunteer inside the prisons and jails are the Volunteers in Corrections, or VICs. Currently, over 80 volunteers in our Diocese visit the jails and prisons on a regular basis to provide the sacraments and a listening ear to our incarcerated brothers and sisters. Volunteers in Prayer, or VIPs, who lift up this ministry with powerful prayer support wherever they are. The VIPs are organized into groups by parish, and commit to praying intentionally for this ministry once per week. Each participating parish has a VIP Parish Coordinator who receives an email each week with prayer intentions from our prison ministry community, and then distributes it to his or her group. Most groups also gather on a monthly basis or so to gather in community for this ministry. For more information or to sign up to be a Parish VIP Coordinator, see "Volunteer Opportunities" below. The final pillar of the MAX Ministry are our Prison Pen Pals. To learn more about this ministry, click here. ​Maximilian was born in 1894 in Poland and became a Franciscan in 1910. He contracted tuberculosis and, though he recovered, he remained frail all his life. Before his ordination as a priest, Maximilian founded the Immaculata Movement devoted to Our Lady. After receiving a doctorate in theology, he spread the Movement through a magazine entitled "The Knight of the Immaculata" and helped form a community of 800 men, the largest in the world. Maximilian went to Japan and built a comparable monastery and then on to India where he furthered the Movement. In 1936 he returned home because of ill health. After the Nazi invasion in 1939, he was imprisoned and released for a time. In 1941 he was arrested again and sent to the concentration camp at Auschwitz. On July 31, 1941, in reprisal for one prisoner's escape, ten men were chosen to die. 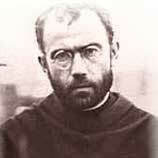 Father Kolbe offered himself in place of a young husband and father. And he was the last to die, enduring two weeks of starvation, thirst, and neglect. St. Kolbe was canonized by Pope John Paul II in 1982; his feast day is August 14.